My apologies, beloveds. I had to cancel this event for logistical reasons. We’ll let you know new Tibet House dates in 2019. Please join Lee Mirabai Harrington for an evening of Buddhist mantra kirtan and healing Tibetan mantra music. Through the call-and-response recitation of these powerful and purifying Tibetan Buddhist mantras, we can align ourselves with divine energies and achieve a state of unity, oneness, transformation, purification and inner peace for the benefit of all beings. Tonight we will focus on mantras that can generate states of deep physical and mental healing, so that we can become strong and healthy enough to truly benefit others. Joining Lee are: Ylfa Edelstein on violin, Sundar Das on flute and Eric Archer on tabla. YOU ARE ENCOURAGED TO PRE-REGISTER TO ENSURE YOUR SEAT. Hailed as “one of the best kept secrets in the chant world,” Lee (Mirabai) Harrington offers a unique form of “Buddha Bhakta” kirtan. With a musical background in classical Indian vocals, rock and gospel, Lee loves to lead high-spirited, uptempo kirtans, combining the metta and wisdom energies of Buddhist mantras with the heart-opening euphoria of the devotional Bhakti tradition. 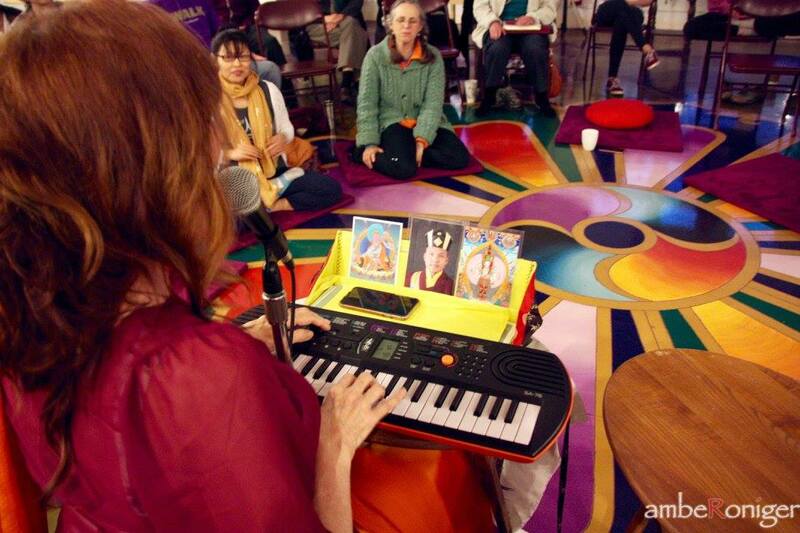 She has been featured at such kirtan festivals as Bhakti Fest, Shaktifest and Ahimsa; as well as at the Omega Institute, Ananda Ashram, Tibet House, Unity Church, Integral Yoga Institute, Sivananda Ashram, Yogaville, The Meher Center, Kagyu Shedrup Choling, Karma Triyana Dharmachakra monastery, Won Dharma Center and many yoga studios and healing centers. Her practice of Tibetan medical mantras also adds a level of profound healing to the experience. Lee’s voice has been described as mesmerizing, majestic, healing, other-worldly, and transcendent. For Lee, leading kirtan is not a performance, but rather a truly spiritual, devotional and healing experience. She believes that each of us has the power and ability to heal the self—and countless others—through our own unique voices and through these mantras. A student of HH the 17th Gyalwang Karmapa and Lama Tsultrim Allione, she has been a Buddhist practitioner since 2002. Other teachers include HH the 14th Dalai Lama, Sakyang MIpham Rinpoche, Khandro Rinpoche, the Dzogchen Ponlop Rinpoche, Mingyur Rinpoche, Khenpo Karthar Rinpoche, Tai Situ Rinpoche, Pema Chodron, Robert Thurman, Lama Norla, Bardor Tulku Rinpoche and many others. She is based mostly in Woodstock, NY. Lee’s first album of mantra music, “BEYOND THE BEYOND: A MANTRA MUSIC EXPERIENCE” was released in 2016 to critical acclaim and was included on several “best of” conscious music lists. She is currently working on a new album of Buddhist mantra music with producer Ben Leinbach.